HomeOhio State BuckeyesCan Ohio State get a 4-star LB to flip? Can Ohio State get a 4-star LB to flip? Let’s just be real positive for a change shall we? With so much negativity tending to swirl around the program, it’s really important to remember the Ohio State Buckeyes are still one of the top programs in the country. Whether you’re talking about wins versus losses, recruiting, coaching staff, or talent, Ohio State has just about everything a football fan would love to have. For Urban Meyer and his staff, they’ve taken quite a few hits on their recruiting, but in reality, the 2019 class has some real gems that will surely be key contributors for the Buckeyes in the coming seasons. For now, the staff is solely focused on closing ‘19 with nothing but positives, as well as continuing the early success for what looks to be a loaded 2020 class. In-state LB a flip candidate? Earlier this week the Buckeyes sent out an offer to Dayton, Ohio, native Jestin Jacobs of Northmont High School. 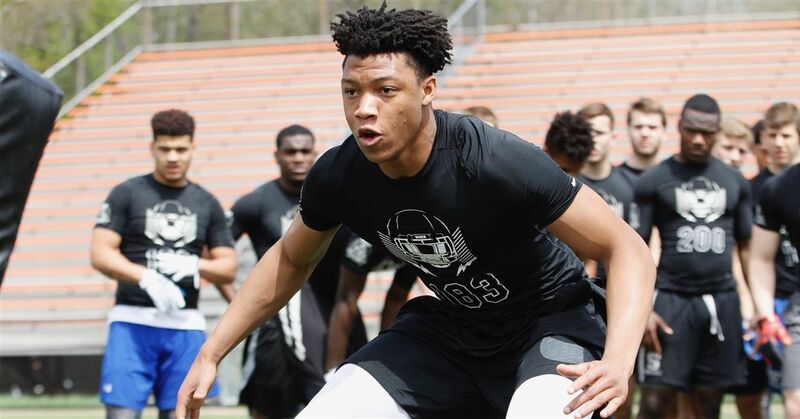 The four-star outside linebacker is currently committed to Big Ten foe Iowa, and the 6-foot-3, 210-pound prospect has been tagged to the Hawkeyes since May. Now though with an in-state OSU offer, the rumors have been swirling that Jestin may be pegged in the end to the Buckeyes. Certainly Iowa and their staff will do what they can to keep Jacobs, but when Ohio State comes calling, it’s hard to shy away from the attention of not only your home state school, but also one of college football’s top premier programs. All of the rumors though can’t be taken too seriously without Jestin wanting or making plans to head to campus for a visit. On Wednesday, though, 247sports’ Director of Recruiting Steve Wiltfong broke the news that the visit plans to Ohio State for Jacobs was in fact in the works, and while Nov. 24 for “The Game” is the slated date, it’s looking as if this visit will be unofficial—meaning Jacobs will probably have a return trip to campus for an official visit somewhere after the season. If the Buckeyes are able to get this local product in town for both an unofficial and official visit, you have to like their chances of pulling off the “flip.” Interestingly enough, the Iowa staff does have pretty strict “no visit” policy for their committed recruits, but it appears this doesn’t seem to be holding back Jacobs. Jestin is currently ranked as the No. 13 player in the Buckeye state and the No. 18 outside linebacker in the country. One may ask why Ohio State wasn’t in on this recruitment from the start, but that’s not the real important aspect. What matters most is knowing the staff is making him a priority, and that the opportunity to play close to home for the Buckeyes may be too good to pass up. Programs like Michigan, Michigan State, and Kentucky take advantage every year with the passed over Ohio kids—and that’s something that looks to be ending. Certainly, keeping Jacobs at home would be a great start and it may very well happen soon. Jestin continues his senior career this weekend in Ohio’s second round of the state playoffs. To see what the Buckeyes could potentially bring to campus, take a look below. Pretty sure you’ll be impressed with what you see.